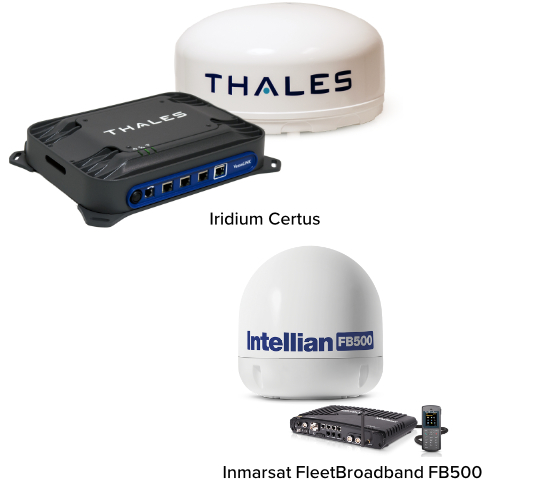 Cobham Satcom and Thales have introduced terminals for Iridium Certus L-band satellite communications services. Iridium Certus provides broadband services over a network of 66 satellites that cover 100% of the globe, including deep oceans and poles. Inmarsat FleetBroadband provides cost-effective voice and data through a compact antenna, delivered globally via the I-4 satellite and ground network, which maintains over 99.9 per cent network availability.